I made this wall hanging for my brother and sister-in-law a few years ago. My sister-in-law just sent me a picture of it today, so I thought I would post it...This was a lot of fun to make! I took a class for it at Quilts, Etc. in Sandy, Utah with my mother-in-law. We learned how to paper-piece the stars. Paper-piecing is really fun and easy. You just have to learn the technique and then your projects will come out perfect every time! It's a great way to get exact seams. You just sew on the lines of the paper and then tear the paper off when you're done. Hmmm...maybe I should do a tutorial on paper-piecing. Anyone interested? Anyways, I loved the embroidery around the border that says, "I pledge allegiance to the flag...with liberty and justice for all." Oh, this is getting me in the mood for the Fourth of July! It's way cute. Yes, you should do a tutorial. Love it, did you do the wording by hand or machine? HAPPY, HAPPY BIRTHDAY, Amber dear! Happy days will come to you all year. If I had one wish, that wish would be... a happy, happy birthday to you from me!! So, yes, a very BIG hApPy BiRtHdAy to you today! I am sure you are in bed by now with all the moving you did today. I really love that wall hanging! And it is making me think 4th of July, too. 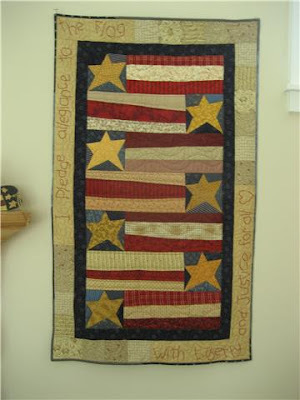 We have to get going on some cute Americana projects.